Right next to MG Road in the heart of the city, a beautiful living 16th century temple. With a quaint old market next to it with narrow lanes and the smell of spices - don't miss that, ask anyone for the vegetable market. This is on the way to Cubbon park, Commercial Street. 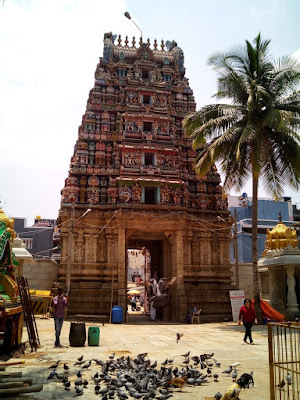 I discovered this temple thanks to the INTACH Heritage Walks. You need to remove your shoes to walk inside, but you can wear socks.